Over the course of three consecutive days last week, students in grades 3-8 took Pearson’s New York State (NYS) Common Core English-language arts (ELA) tests. As was the case in 2013, 2014 and 2015, the 2016 ELA tests were developmentally inappropriate, confusing and tricky. 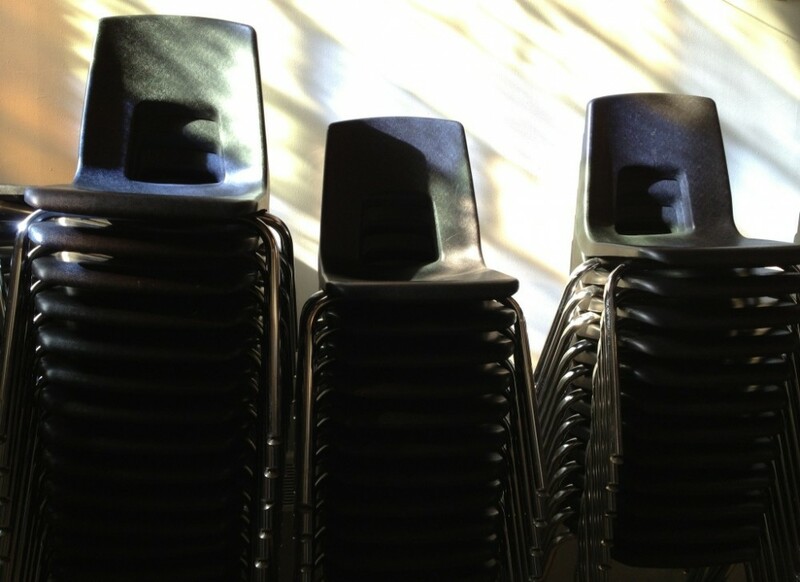 Despite the New York State Education Department (NYSED)’s “adjustments” to the 2016 assessments, there was no improvement to the quality of the tests. While I am barred from disclosing the reading passages and questions that appeared on the tests, in no way will I refrain from broadcasting to the world how outraged I continue to be – year after year – over New York’s oppressive testing regime. Since 2013, when Pearson’s Common Core tests were first administered in New York state, I’ve been documenting this nightmare on my blog. On 4/3/16, Lauren Cohen and I demonstrated at NYC councilman Danny Dromm’s rally in Jackson Heights, Queens. Dromm was informing parents of their right to opt-out of the NYS Common Core tests. As a member of the MORE caucus of the UFT, Lauren is running for VP of Elementary Schools in the upcoming UFT election. She truly puts children first. Here are my thoughts on the 2016 ELA test. I have focused on third grade because these students – aged eight and nine – are our youngest NYS Common Core test-takers. 1.) The 2016 Common Core ELA test was as absurdly long as it was in 2013, 2014 and 2015 despite the fact that it was shortened by just one reading passage and by a handful of multiple choice questions. Day One: 4 reading passages, 24 multiple-choice questions (Students darken the circles on Answer Sheet 1). Day Two: 3 reading passages (same as 2015), 7 multiple-choice questions (Students darken the circles on Answer Sheet 2), 2 short-response questions (Students write answers directly in Book 2.) 1 extended-response question (Students write answer directly in Book 2). Day Three: 3 reading passages (same as 2015), 5 short-response questions (Students write answers directly in Book 3) and 1 extended-response question (Students write answer directly in Book 3). TOTALS: 10 reading passages, 31 multiple-choice questions, 7 short-response questions and 2 extended-response questions. For the short-response questions, students typically write a paragraph-long response that must include at least two details from the passage. The extended-response question requires an essay-like written response: introduction, supporting evidence/details, conclusion. Where is the NYSED’s research that shows that this is an educationally sound testing program for a third grader? Seriously. Does anyone know how the NYSED justifies this? The length alone of these tests warrants our banging of pots and pans in city streets. 2.) Now let’s move on to content. The reading passages were excerpts and articles from authentic texts (magazines and books). Pearson, the NYSED or Questar did a poor job of selecting and contextualizing the excerpts in the student test booklets. How many students actually read the one-to-two sentence summaries that appeared at the beginning of the stories? One excerpt in particular contained numerous characters and settings and no clear story focus. The vocabulary in the non-fiction passages was very technical and specific to topics largely unfamiliar to the average third grader. In other words, the passages were not meaningful. Many students could not connect the text-to-self nor could they tap into prior knowledge to facilitate comprehension. 3.) The questions were confusing. They were so sophisticated that it appeared incongruous to me to watch a third grader wiggle her tooth while simultaneously struggle to answer high school-level questions. How does one paragraph relate to another?, for example. Unfortunately, I can’t disclose more. The multiple-choice answer choices were tricky, too. Students had to figure out the best answer among four answer choices, one of which was perfectly reasonable but not the best answer. Here’s what P.S. 321’s principal, Elizabeth Phillips, wrote about the 2014 Common Core tests. Her op-ed We Need to Talk About the Test appeared in The New York Times on April 9, 2014. These same issues were evident on the third grade 2016 ELA test. Yet for the NYS Common Core ELA test, the NYSED expects all third graders to be able to decode and comprehend texts that are typically used with fourth, fifth and sixth graders? Leonie Haimson, Executive Director of Class Size Matters, noted in a post on her blog NYC Public School Parents that this “…appears to violate the NY law passed in 2014 that limits state testing time to one percent of total instructional time.” Additionally, fellow Change the Stakes member, Rosalie Friend, pointed out that “without a set time limit, the tests no longer are standardized. Therefore, one cannot draw ANY conclusions from the scores.” So this alone seems to invalidate these $44 million tests. Collectively, we must stop this insanity. I’ve been sounding the alarm on these tests since 2013, and the vast majority of educators I know agree with me. I’m beyond fed-up that I have to continue to administer these assessments to my students. It is unconscionable to me that Chancellor Fariña, in her 3/15/16 letter to NYC parents, wrote that these tests are “incredibly important” and a “valuable experience for our students.” It’s been nearly a month since I read those words and my jaw is still on the floor. Parents – if you haven’t already refused the tests, you still have time to opt-out of the Common Core math tests, which will be administered on April 13, 14 and 15 of this week. Teachers and administrators – the Common Core testing climate in New York state is too dire for you to remain quiet. Speak up and encourage parents to opt-out. Boycotting these tests is the only way to change course. May this video of these principled MORE teachers inspire you. 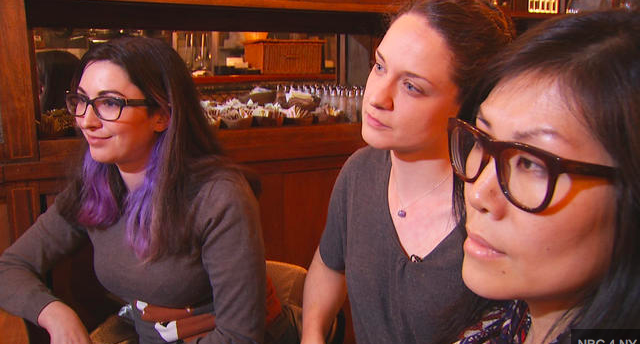 From left to right: NYC teachers Lauren Cohen, Kristin Taylor and Jia Lee spoke critically of the NYS Common Core tests to NBC 4 New York. Screenshot courtesy of NYC teacher and UFT chapter leader Arthur Goldstein who blogs at nyceducator.com. 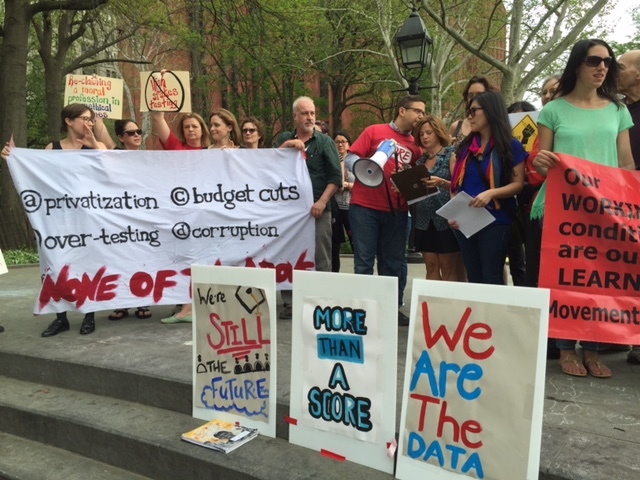 On the afternoon of Tuesday, May 5, 2015, a group of concerned NYC public school teachers and parents – representing the Movement of Rank and File Educators (the MORE Caucus of the UFT), Teachers of Conscience and Change the Stakes – convened in Manhattan’s Washington Square Park to demonstrate against corporate education reform and its destructive and secretive high-stakes testing program. We displayed posters and spoke from the heart about our individual experiences. For the first time in months (years? ), I felt truly appreciated for the work I do in the trenches. Rosalie Friend, a member of Save our Schools and Change the Stakes as well as an educational psychologist, declared that she was standing up for us and our professional standards. Film editor Michael Elliot has been an unsung hero as a public school parent activist. 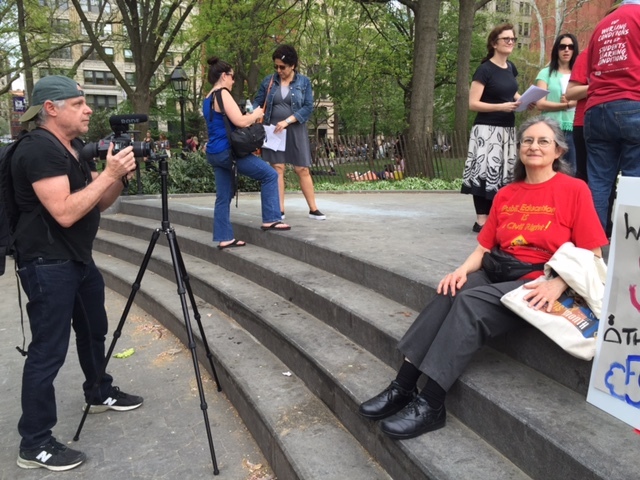 From Chicago to New Jersey to the boroughs of New York City, Michael has been documenting our work, which includes the burgeoning grassroots opt-out movement. Please watch Michael’s other videos on shoot4education. They include the May 5 speeches given by NYC Teachers of Conscience Jia Lee, Marcus McArthur, Eunice Eun and Chen Lin, Alexandra Alves, Megan Moskop, Lauren Cohen, Holly Spinelli and Colin Schumacher (in absentia). A group of teachers also sang a clever song – If Cuomo Had A Heart – that highlighted Governor Cuomo’s wrong-headed educational plan for our state. 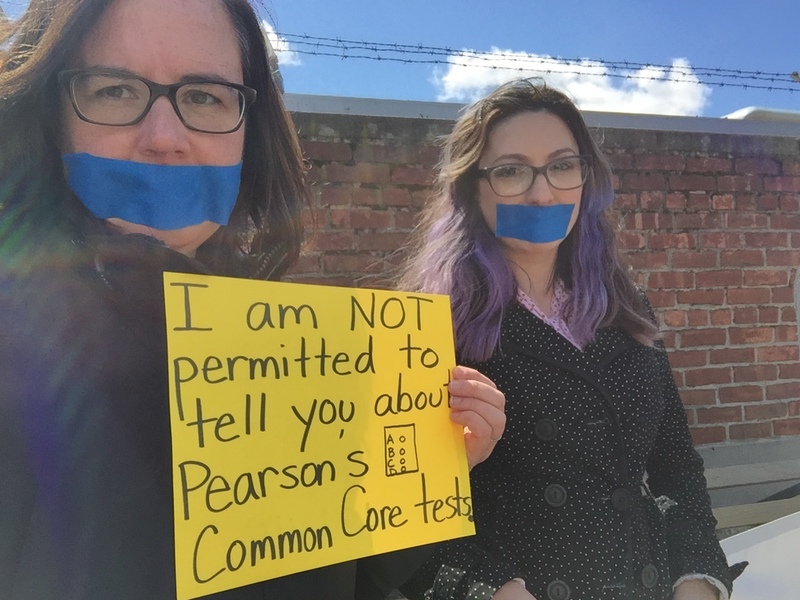 Prior to speaking, Teachers of Conscience wore tape over their mouths to convey to the public the lack of transparency with regards to these tests. We are not allowed to divulge any test content. Here is the transcript of my speech. You can also view it here on YouTube. This week, our youngest learners – students in kindergarten, first and second grades – are taking NYC Performance Assessments in English-language arts (ELA) as measures of student learning (MOSLs). They are for teacher evaluation purposes only. Scores from these tests count towards 20% of our overall rating. What our students are being asked to do is developmentally inappropriate. The task fails to consider early childhood studies, which show that “the average age at which children learn to read independently is 6.5 years.” Some don’t read independently until age seven and THIS is normal. (Please see Defending the Early Years for more information). What is NOT normal is bombarding first graders with information from two different science texts and expecting them to judiciously select relevant facts to answer two written response questions. What is NOT normal is expecting first grade students to independently read and to gather facts/evidence from a non-fiction text that is two grade levels above their reading level. My first grade students are being asked to independently read a 3rd grade text – level M – without my support. And they are to use facts from that book to answer questions independently. In addition, this text contains errors. The wrong photograph is used to describe a key fact, but I cannot go into more detail about this, unfortunately. Now my struggling readers can’t use the photographs to help them answer the questions. What is WRONG is that my students are losing valuable instructional time to take these flawed tests. What is WRONG is that my “professional development” time is being used to score these tests. What is WRONG is that working first grade teachers played no part in creating these tests that are being used to rate us. What is WRONG is that the New York City Department of Education did NOT correct the errors that were pointed out the them. As a Teacher of Conscience, I have a moral imperative to know my students well and to understand their learning. I am discerning when considering the reliability and validity of assessment methods. I speak out to correct the wrongs.